A new article published int he journal, i-Perception presents a new optical illusion called “curvature blindness illusion”. It is written by a researcher, Kohske Takahashi. Do you see sharp lines? Takahashi explains the reasoning behind this as our brain’s default to seeing corners rather than curves when it gets confused. The underlying mechanisms for the gentle curve perception and those of obtuse corner perception are competing with each other in an imbalanced way and the percepts of corner might be dominant in the visual system. This is very similar to the illusion of bent lines. 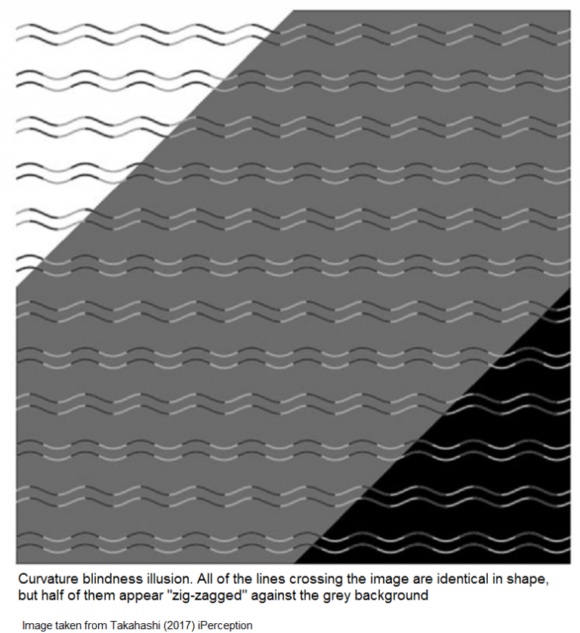 But on the curvature blindness illusion is a play on contrasting colors in the background. Prev What is this black thing?